The Healthy Eating Pyramid sits on a foundation of daily exercise and weight control. Why? These two related elements strongly influence your chances of staying healthy. They also affect what you eat and how your food affects you. Exercise and weight control are also linked through the simple rule of energy balance: Weight change = calories in – calories out. If you burn as many calories as you take in each day, there’s nothing left over for storage in fat cells, and weight remains the same. Eat more than you burn, though, and you end up adding fat and pounds. Regular exercise can help you control your weight, and it is a key part of any weight-loss effort. The body uses carbohydrates mainly for energy, and it can get them from many sources—some healthful (beans, vegetables, fruit, whole grains), and some not (sugary sodas and other drinks, sweets). The best grain sources of carbohydrates are whole grains such as oatmeal, whole wheat bread, and brown rice. They deliver the outer (bran) and inner (germ) layers along with energy-rich starch. The body can’t digest whole grains as quickly as it can highly processed carbohydrates such as white flour. This keeps blood sugar and insulin levels from rising, then falling, too quickly. Better control of blood sugar and insulin can keep hunger at bay and prevent the development of type 2 diabetes and heart disease. 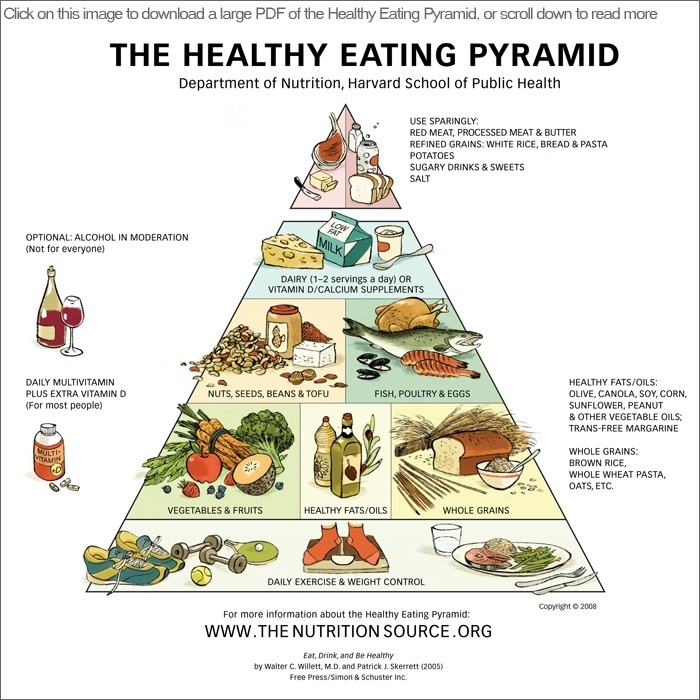 Surprised that the Healthy Eating Pyramid puts some fats near the base, indicating they are okay to eat? Although this recommendation seems to go against conventional wisdom, it’s exactly in line with the evidence and with common eating habits. The average American gets one-third or more of his or her daily calories from fats, so placing them near the foundation of the pyramid makes sense. Note, though, that it specifically mentionshealthy fats and oils, not all types of fat. Good sources of healthy unsaturated fats include olive, canola, soy, corn, sunflower, peanut, and other vegetable oils; trans fat–free margarines; nuts, seeds, and avocados; and fatty fish such as salmon. These healthy fats not only improve cholesterol levels (when eaten in place of highly processed carbohydrates), but the fats in fish can also protect the heart from sudden and potentially deadly rhythm problems. A diet rich in vegetables and fruits has bountiful benefits. Among them: It can decrease the chances of having a heart attack or stroke; possibly protect against some types of cancers; lower blood pressure; help you avoid the painful intestinal ailment called diverticulitis; guard against cataract and macular degeneration, the major causes of vision loss among people over age 65; and add variety to your diet and wake up your palate. On the Healthy Eating Pyramid, potatoes don’t count as a vegetable, since they are chock full of rapidly digested starch, and they have the same effect on blood sugar as refined grains and sweets. That’s why potatoes are in the “Use Sparingly” tip. These plant foods are excellent sources of protein, fiber, vitamins, and minerals. Beans include black beans, navy beans, garbanzos, lentils, and other beans that are usually sold dried. Many kinds of nuts contain healthy fats, and packages of some varieties (almonds, walnuts, pecans, peanuts, hazelnuts, and pistachios) can carry a label saying they’re good for your heart. Eating nuts and beans in place of red meat or processed meat can lower the risk of heart disease and diabetes. These foods are also important sources of protein. A wealth of research suggests that eating fish can reduce the risk of heart disease, since fish is rich in heart-healthyomega-3 fats. Chicken and turkey are also good sources of protein and can be low in saturated fat. Eggs, which have long been demonized because they contain fairly high levels of cholesterol, aren’t as bad as they’ve been cracked up to be. In fact, an egg is a much better breakfast than a doughnut cooked in an oil rich in trans fats or a bagel made from refined flour. People with diabetes or heart disease should limit their egg yolk consumption to no more than three a week; they can try egg whites, instead, which are very high in protein and are a fine substitute for whole eggs in omelets and baking. Building bone and keeping it strong takes calcium, vitamin D, exercise, and a whole lot more. So why does the Healthy Eating Pyramid recommend limiting dairy products, which have traditionally been Americans’ main source of calcium and vitamin D? Because most people need more vitamin D than they can get from drinking three glasses of milk—and they need less calcium than three glasses of milk provide. Though there are some health benefits from modest dairy intake, high dairy intakes are associated with increased risk of fatal prostate and maybe ovarian cancers. There are other healthier ways to get calcium than from milk and cheese, which can contain a lot of saturated fat; cheese is also high in sodium. If you enjoy dairy foods, stick to one to two servings a day; you may also need to take a multivitamin or vitamin D supplement to get enough vitamin D. If you don’t like dairy products, taking a vitamin D and calcium supplement (or taking the right multivitamin) offers an easy and inexpensive way to meet your needs for these micronutrients. These foods sit at the top of the Healthy Eating Pyramid because they contain lots of saturated fat. Processed meats, such as bacon, hot dogs, and deli meats are also very high in added sodium. Eating a lot of red meat and processed meat has been linked to increased risk of heart disease, diabetes, and colon cancer. So it’s best to avoid processed meat, and to limit red meat to no more than twice a week. Switching to fish, chicken, nuts, or beans in place of red meat and processed meat can improve cholesterol levels and can lower the risk of heart disease and diabetes. So can switching from butter to olive oil. And eating fish has other benefits for the heart. Why are these all-American staples at the top, rather than the bottom, of the Healthy Eating Pyramid? White bread, white rice, white pasta, other refined grains, potatoes, sugary drinks, and sweets can cause fast and furious increases in blood sugar that can lead to weight gain, diabetes, heart disease, and other chronic disorders. Whole grains cause slower, steadier increases in blood sugar that don’t overwhelm the body’s ability to handlecarbohydrates. The salt shaker should be used sparingly, based on extensive research linking high-sodium diets to increased risk of heart attack and stroke. Since most of the sodium in our diets comes from processed foods, such as cheese, breads, deli meats, spaghetti with sauce, and food prepared away from home, make sure to compare food labels and choose foods with the lowest sodium values. Scores of studies suggest that having an alcoholic drink a day lowers the risk of heart disease. Moderation is clearly important, since alcohol has risks as well as benefits. For men, a good balance point is one to two drinks a day; in general, however, the risks of drinking, even in moderation, exceed benefits until middle age. For women, it’s at most one drink a day; women should avoid alcohol during pregnancy. You’ll notice that the Healthy Eating Pyramid does not give specific advice about the numbers of cups or ounces to have each day of specific foods. That’s because it’s not meant to be a rigid road map, and the amounts can vary depending on your body size and physical activity. It’s a simple, general, flexible guide to how you should eat when you eat. To follow the Healthy Eating Pyramid, there’s just one basic guideline to remember: A healthy diet includes more foods from the base of the pyramid than from the higher levels of the pyramid. Within this guideline, however, there’s plenty of flexibility for different styles of eating and different food choices. A vegetarian can follow the Healthy Eating Pyramid by emphasizing nuts, beans, and other plant sources of protein, and choosing non-dairy sources of calcium and vitamin D; someone who eats animal products can choose fish or chicken for protein, with occasional red meat. Choosing a variety of fresh, whole foods from all the food groups below the “Use Sparingly” category in the Healthy Eating Pyramid will ensure that you get the nutrients you need. It will also dramatically lower your salt intake, since most of the salt in the U.S. diet lurks in processed food—canned soups, frozen dinners, deli meats, snack chips, and the like. Perhaps the only foods that are truly off-limits are foods that contain trans fat from partially hydrogenated oils. Luckily, in the U.S. and Canada, trans fats must be listed on nutrition labels. More and more food manufacturers, restaurants, and even entire communities are going trans fat–free, making it easier to avoid this health-damaging type of fat. Fill half of your plate with vegetables and fruits. The more color, and the more variety, the better. Most Americans don’t get enough vegetables, especially the dark green and red-orange types, or fruits. On the Healthy Eating Plate, just like the Healthy Eating Pyramid, potatoes and French fries don’t count as vegetables. Save a quarter of your plate for whole grains—not just any grains: MyPlate tells you to reserve a quarter of your plate for grains. But grains are not essential for good health. What’s essential is to make any grains you eat whole grains, since these have a gentler effect on blood sugar and insulin than refined grains. Whole grains include whole wheat, brown rice, oats, barley, and the like, as well as foods made with them, such as whole wheat pasta. The less processed the whole grains, the better: Finely ground grain is more rapidly digested, and in turn, has a greater impact on blood sugar than more coarsely ground or intact grains. So choose steel cut oats instead of instant, sugared oats or choose whole wheatberries instead of whole wheat bread. Pick a healthy source of protein to fill one quarter of your plate: On MyPlate, the “protein” quadrant of the plate could be filled with a hamburger or hot dog. The Healthy Eating Plate, in contrast, acknowledges that some protein sources (fish, chicken, beans, nuts) are healthier than others (red meat and processed meat). Enjoy healthy fats. The glass bottle near the Healthy Eating Plate is a reminder to use healthy oils, like olive and canola, in cooking, on salad, and at the table. Limit butter, and avoid unhealthy trans fats. Though the Dietary Guidelines for Americans 2010 acknowledges that Americans need to consume more plant oils, these healthy oils are nowhere to be found on MyPlate. Drink water, coffee or tea. On the Healthy Eating Plate, complete your meal with a glass of water, or if you like, a cup of tea or coffee (which also are low calorie and have health benefits)—not the glass of milk that MyPlate recommends. (Questions about caffeine and kids? Read more.) Limit milk and dairy products to one to two servings per day and limit juice to a small glass per day. Skip the sugary drinks. Stay active. The figure scampering across the bottom of the Healthy Eating Plate’s placemat is a reminder that staying active is half of the secret to weight control. The other half is eating a healthy diet with modest portions that meet your calorie needs. Since two out of three U.S. adults and one in three children are overweight or obese, one thing is clear: Many of us have been choosing plates that are too large. 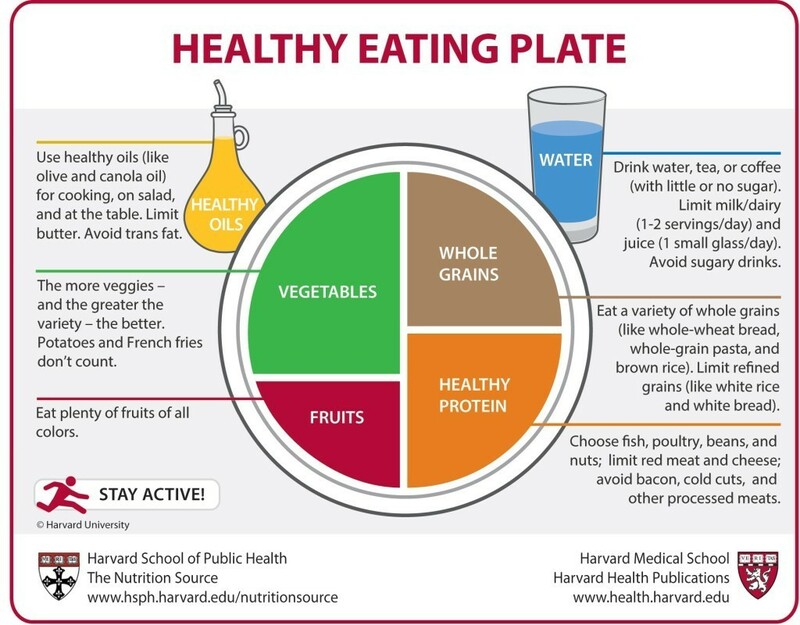 The Healthy Eating Pyramid and the Healthy Eating Plate complement each other. Both emphasize foods that promote good health. And both encourage people to limit or avoid foods and drinks that are harmful, or that provide lots of calories but have little nutritional value. Think of the Healthy Eating Pyramid as your grocery list: Vegetables, fruits, whole grains, healthy oils, and healthy proteins like nuts, beans, fish, and chicken should make it into your shopping cart every week. Add a little yogurt or milk if you like. Skip the soda and snack food aisle, the deli counter, and the steaks and chops at the butcher counter. Let the Healthy Eating Plate be your guide to planning a healthy, balanced meal and serving it on a dinner plate—or packing it in a lunch box. Put a copy on the refrigerator at home or at work, to give you a visual guide to portioning out a healthy plate, and a reminder to pump up the produce. The Healthy Eating Pyramid also addresses other aspects of a healthy lifestyle—exercise, weight control, vitamin D and multivitamin supplements, and moderation in alcohol for people who drink—so it’s a useful tool for health professionals and health educators. People at this acupuncture Mississauga clinic not only focuses on the problem areas that I highlight but also looks for subtle locations that I am often not aware of but are actually affecting my pain levels. They also makes sure to give me holistic pain relief including stress.